The mobile laboratory is capable of evaluating the presence of organic compounds, organic/inorganic sulfides and amines and other compounds to the part per billion / part per million concentration ranges, and provide RESULTS IN ABOUT 30 MINUTES! For a laboratory this is absolutely amazing! Conventional labs take 10 to14 days on normal turnaround and if expedited, can cost 2x or more the standard price. This laboratory is ideal for investigations where the scope and details of an environmentally challenged site are unknown. 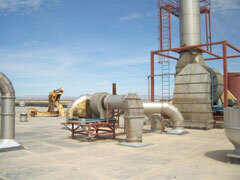 It is also useful for environmental equipment tuning and testing. Before we start testing, we take time to fully understand exactly what needs to be accomplished. 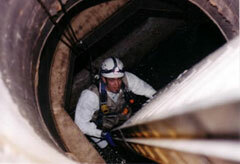 We then develop a protocol based on EPA approved methods that accurately measures the variable(s) being tested. After careful study of the site conditions, we gather enough analytical data to fully understand the characteristics of the problem. This gives us the necessary details to develop a proposed solution to resolve it. 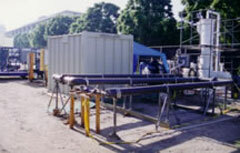 In situations where additional data is required, we utilize the mobile laboratory in conjunction with pilot testing to develop or optimize the chemical process and equipment design required to optimally clean toxic or odorous air. Pacific Rim offers you an advantage. 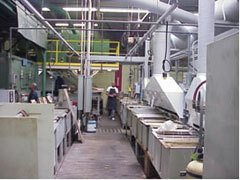 Our experience in equipment design and operation allows us to ensure your abatement control equipment is working optimally before samples are taken. Our experience in process and equipment design is also of value in the selection of testing methodology and sampling points. These two make a huge difference in test results. View a table listing of Organic Compounds or Sulfer, Particulate and Other Compounds Pacific Rim is familiar with testing. This project provides another example of Pacific Rim Design & Development's (PRDD) innovative skill in environmental air quality process development. 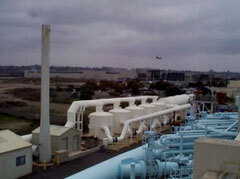 In this example, Pacific Rim successfully negotiated important amendments to South Coast Air Quality Management District (SCAQMD) Permit to Construct and Permit to Operate documents, which dramatically benefited the client by eliminating costly regulatory compliance restraints. 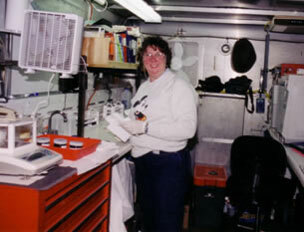 Pacific Rim's mobile analytical laboratory was an integral part of the team assembled to answer the question: How polluted is it and what options for cleaning are available? This project utilized many of Pacific Rim's areas of expertise. We successfully abated most of a $131K fine, dramatically relaxed the odor control equipment operating constraints, and re-used existing odor control equipment. In this project, the City of San Diego and the State of California funded odor control research in an effort to reduce energy consumption and improve air quality. Pacific Rim was retained to write the research methodology, and then systematically studied each of the process scenarios. Three firms including Pacific Rim were asked to design and pilot test ideas to remove odor from ground water in Beverly Hills. Pacific Rim's approach turned out to be the best. All Text ©Copyright 2008 Pacific Rim Design & Development, Inc.